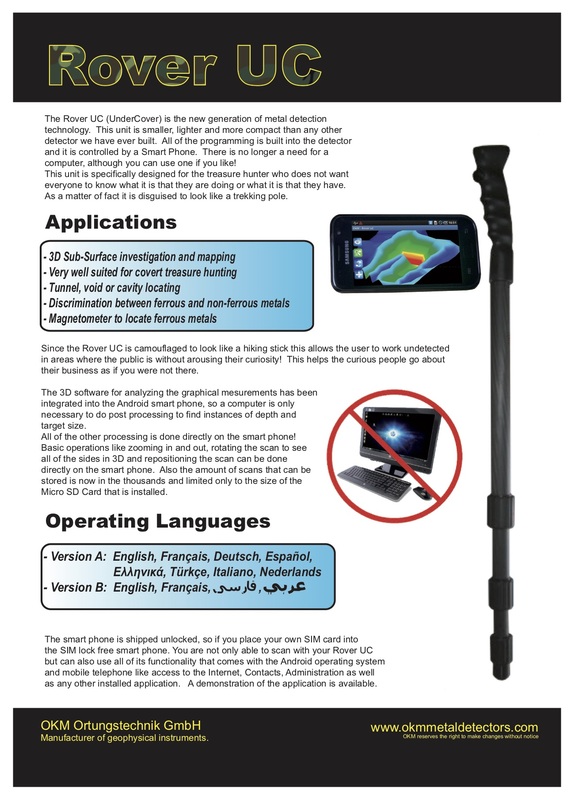 OKM Rover UC is a new generation of metal detecting technology. Allow us to introduce a new deep seeking detector which is smaller, lighter and more compact that any detector we’ve previously built. 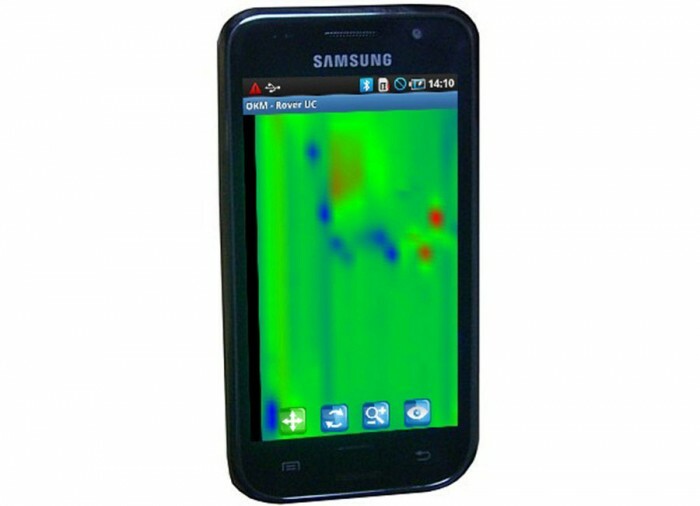 The unit’s programming is controlled by a smart phone. No need to have a computer to see buried items. OKM Rover UC is based on the well-proven, reliable and powerful technology of the Rover Series, in which many details has been optimized and improved. 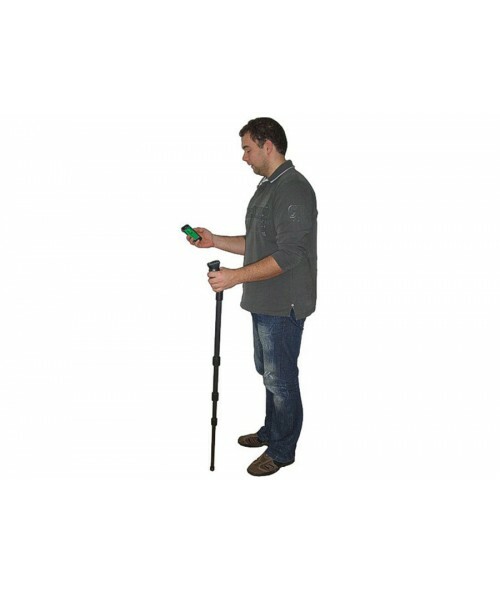 Thus the multi-functional Rover UC metal detector is able to locate buried items like gold, silver, chests and boxes as well as hidden rooms, graves and tunnels. So the Rover UC metal detector is suitable for every undercover treasure hunt. 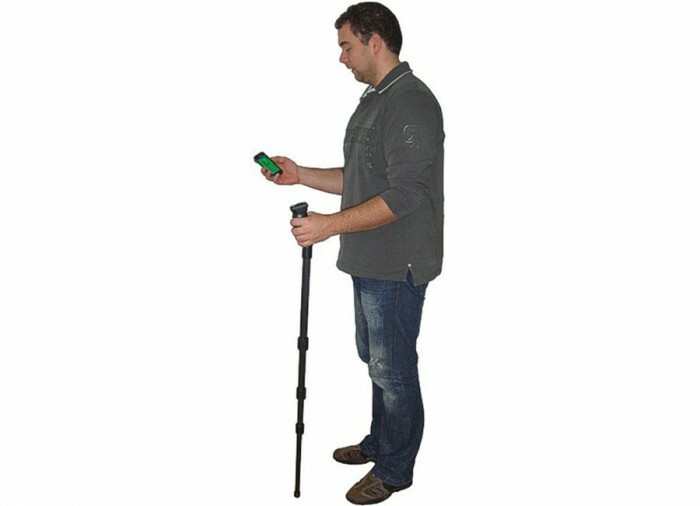 The length of the trekking pole can be adjusted individually because of its telescopic mechanism and is equipped with an integrated FM radio. 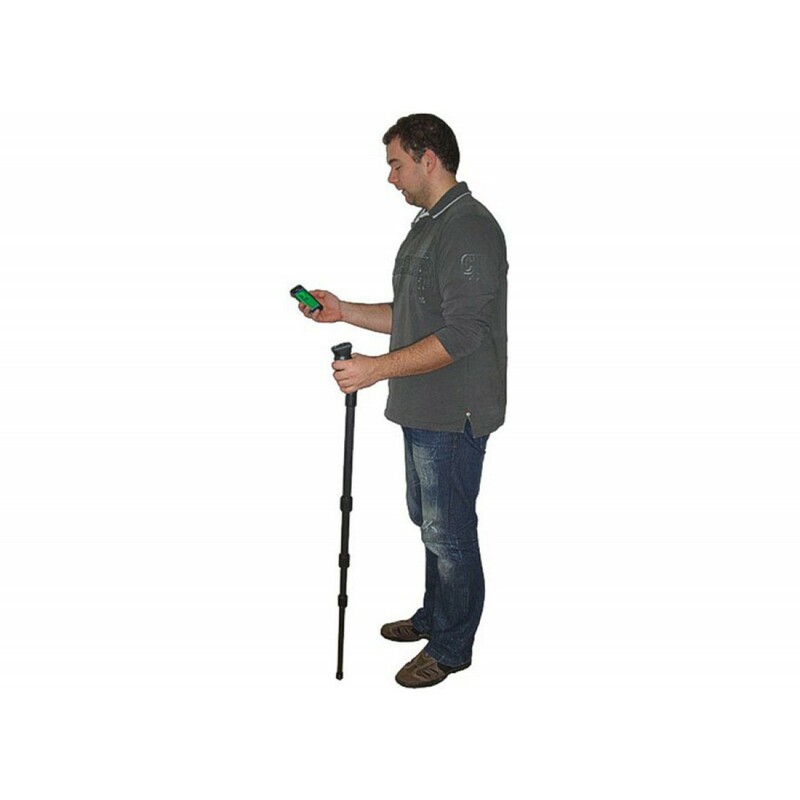 Thus the OKM Rover UC metal detector is usable as a functional multimedia-based hiking stick to bring its camouflage to perfection. Due to modern processors and energy-saving components two standard AA batteries are enough to supply the full power of the detector. 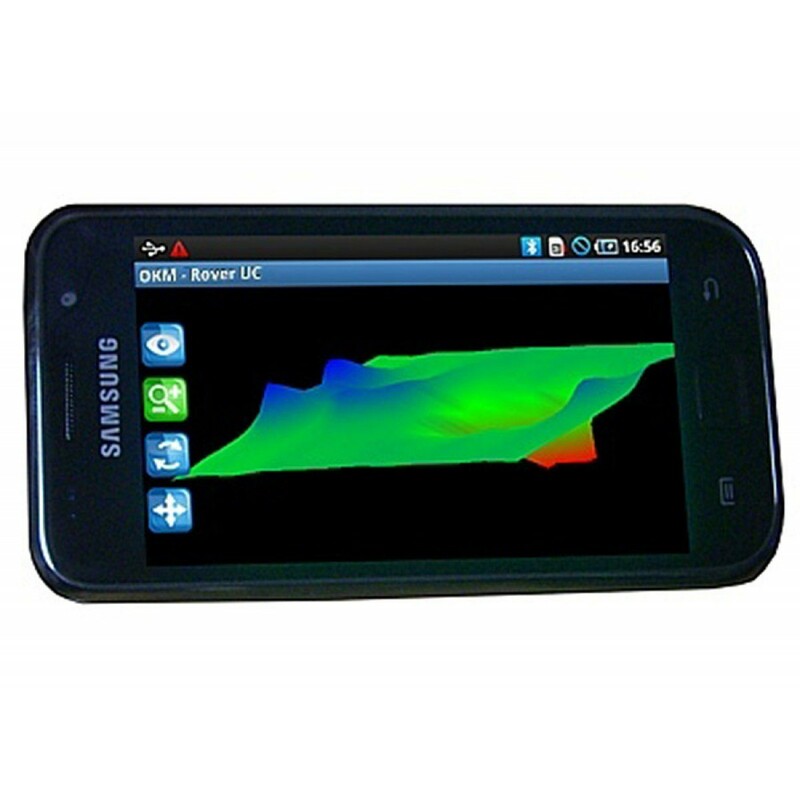 The 3d software for analyzing the graphical measurements has been integrated completely into an Android smart phone, so you don't need any computer for data analysis, also dramatically reducing the weight. 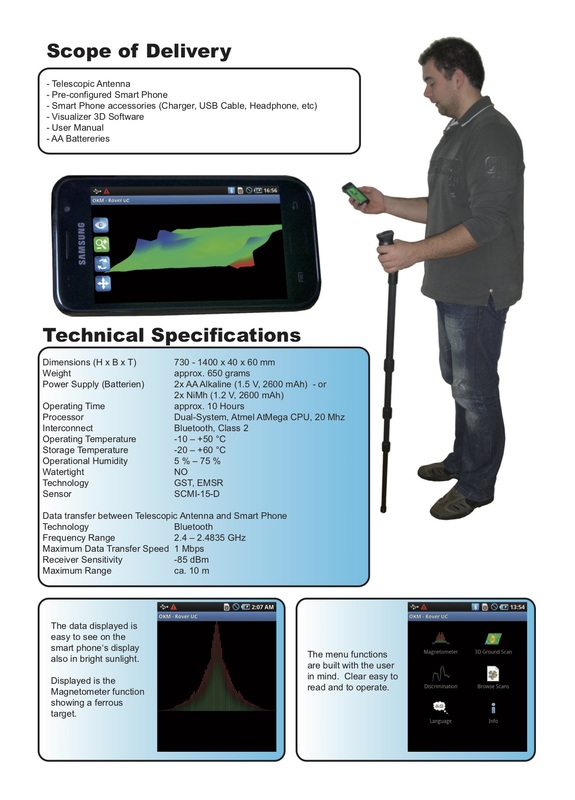 Based on the processing power of today's smart phones our engineers and software developer created an easy to use high-tech 3d ground scanner. It offers everything necessary to quickly and efficiently process measurements. As a result of its handy touchscreen you can rotate, zoom and resize all of the displayed 3d graphics by just using your finger. 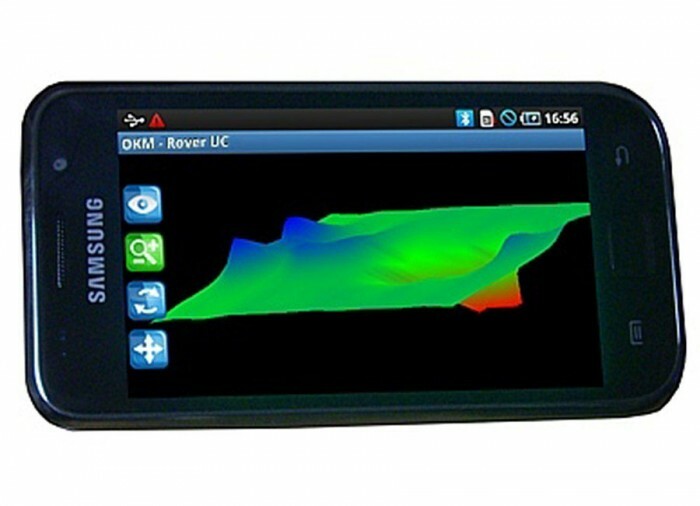 The smart phone is shipped unlocked, so if you place your own SIM card into the SIM lock free Android smart phone you are able to not only scan with Rover UC but use it as a normal phone with all its functionality like Internet access, contact, administration, as well as any other installed application. Like all other metal detectors of the Rover Series, the Rover UC is a stunning blend of functionality, ergonomics and practical design. Due to its small weight of just 0.65 kg you can take it everywhere you want. By using just one button you can manage all operating modes. All measurements can be instantly analyzed on-site. If required you are able to save and reopen all graphics on the smart phone for further analysis if necessary. For those who still wish to use a PC, the Rover UC scan images are fully compatible with our award winning Visualizer 3D software. 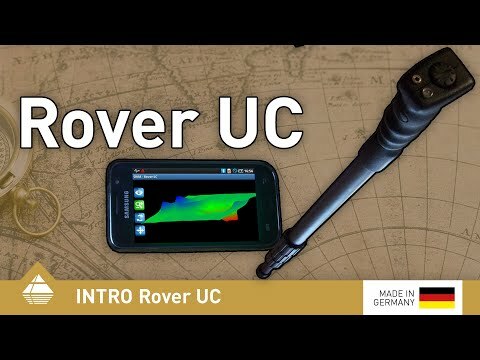 Measured data of the metal detector Rover UC can be transferred to any computer via the smart phone's USB cable. 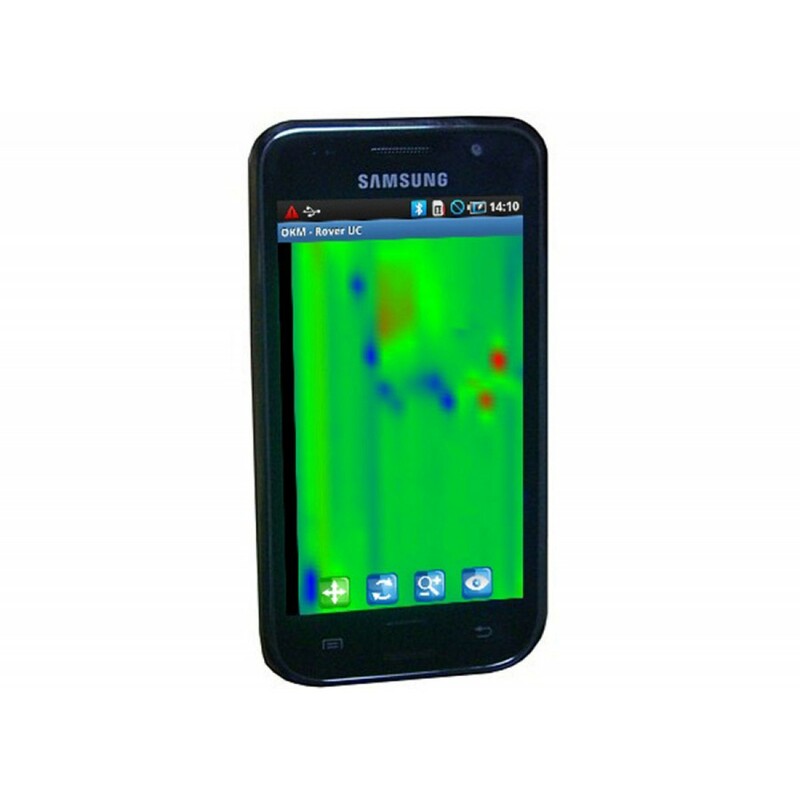 After transferring the data, scans can be analyzed with the Visualizer 3D software. This makes it possible to get exact information about the size of the buried or sub-surface object. Fine scans can show precise shapes of the target when measured and recorded in High Definition mode. This meteorite was found with the treasure hunting equipment Localizer 3000. The object was situated at a depth of 0,60 m under the ground. The ancient dagger was located by 3d ground scanner eXp 3000 in a depth of 60 cm. The iron blade is in well preserved condition, there is only a small piece of the wooden handle left. The discovered object is assigned to the Middle Age. This copper rock was found at a depth of 50 cm by the metal detector Rover Deluxe. Customers from Greece found this non-metallic glass vase with Rover C in about 1 m depth in neutral soil. These antique door beaters were located by a Middle East customer in a depth of 140 cm with his metal detecting instrument eXp 4500. The objects are made of gold. 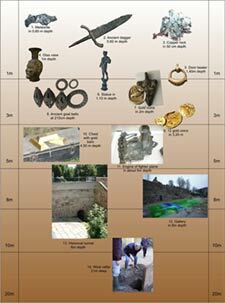 Antique statue was found with the multi-sensor instrument Future 2005 in a depth of 110 cm. Several gold coins were dug up in Greece. They were situated at about 2 m deep under ground. The tomb of a shepherd together with his personal belongings like these ancient goat bells were discovered with eXp 4500 and Future 2005 in a depth of 210 cm in clay soil. An accumulation of gold coins was detected with the treasure detector eXp 5000 in 3,20 m depth in rocky soil. This sensational discovery of a chest with gold bars was detected with the OKM earth imager eXp 3000 in aprox. 4,50 m depth. The engine of a fighter plane was located by Future I-160 at about 5 m depth under concrete soil. A gallery could be located by the metal detector eXp 5000 at 8 m depth. The diameter of this detected tunnel is 1,50 m.
During official tests this historical tunnel was located in a depth of 6 m under pavement. The tunnel has a diameter of 1 m.
This old historic wine cellar was dug up in France. This chamber was situated at 21 m depth. This product has no reviews. Be the first to write one! Start receiving news & exclusive savings today! © 1998 - 2019 Kellyco Metal Detectors. All Rights Reserved.